The Considered Kula | Sociology and the yoga community. Sociology and the yoga community. Here is a collaboration worth waiting for. The spirit of Alexander Hamilton reaches through to the present. I hope you find this as moving as I did, and find the original on Hamildrops. Newman also identified appropriate policy options in the immediate aftermath of school shootings, and for prevention. Proposals which seek to institute background checks, and provide schools resources such as mental health services, are all a part of a broad spectrum of reasonable options to increase school safety. However, these also play into conservative framing that mental health issues are paramount, and that we can leave guns untouched. This framing does nothing to create safety for disadvantaged communities and communities of color. Katherine Newman and others often create policy options which do not stigmatize particular communities and have broad appeal, a sort of “motherhood and apple pie” approach. School shootings are rare, but increasing mental health services to schools is not only preventative, but has a broader reach, including as support to overworked teachers. Likewise, inasmuch as George Farkas’s findings on the black-white test score gap do implicate culture to a small degree, his policy options are “motherhood and apple pie,” like reducing class size and increasing access to early childhood education. They help everyone, but help the disadvantaged disproportionately, because they, unlike the privileged, don’t otherwise have easy access to such things. (These appear even in the corporate–sponsored Education Reform Act of 1993 in the Commonwealth of Massachusetts.) In short, I argue that reasonable policy options cannot leave guns untouched. Can any form of gun control prevent a person like [Jared] Loughner from accessing powerful weaponry? Unfortunately background checks, as prescribed by the Brady Law of 1994, do not necessarily provide effective preventative measures against the onslaught. Few mass killers have criminal or psychiatric records. Furthermore, most mass murderers would not consider buying a weapon through illegal means. After all, they see themselves as law–abiding citizens who are only looking for some justice. Arming teachers, even with a requirement for firearms training, creates the potential for tragic overresponse by anxious school personnel. Every year in the United States, thousands of students are expelled for being in possession of a gun at school (and sometimes just for fear of gangs or bullies)., What would occur if the students were observed by a faculty member who was also armed and ready to respond with gun fire in order to protect the school population? In addition, what would be the result if an armed teacher were to mistake a cell phone or any shiny object for a gun, especially in a climate where concerns for school shootings were elevated? At the end of the day, school teachers are in the position to be educators, not executioners (297). This is clearly quite resonant with the concerns of the Black Lives Matter movement, the shadow movement of March for Our Lives, in the sense of what is cast by the bright light of white privilege. [W]hen I work with teachers, I tell them all the time: You may be creating the only space in a child’s life where he or she can walk in, hang up their backpack, and hang up their armor. Only for the hour or two hours this child is with you can they literally take that off. When we arm teachers, or otherwise turn schools into armed camps, we remove what for disadvantaged children might be the one safe haven in their lives. This is the difference that privilege creates. Newman observes schools are often the only public stage in suburban and rural communities in which rampage school shootings are likely to occur, and in such shootings it’s typically the institution that’s targeted. For disadvantaged communities, schools are the safe haven away from the places violence against youth is more likely to occur. Let’s choose “motherhood and apple pie” policy options that are empirically supported, rather than unsustainable ideological ones like arming teachers because they resonate with the fears of communities and further marginalize them. Considering the political fire of the Parkland survivors, I’m reminded of some words the late, great Elise Boulding wrote in her book Cultures of Peace: The Hidden Side of History (Syracuse, NY: Syracuse University Press, 2000), about youth-adult partnerships in the culture of peace. What can we expect from the new movements in the twenty–first century? Can we envision a future in which there is a preteen and teenage member of every city council, every local citizen’s committee, every state legislature, and every national House of Parliament? Will communities of faith support teen participation in decision–making? Will school systems shift to a more community–based, apprenticeship–focused mode of education? Will families hold democratic councils? Will youth and age dance together, sing together, play together? If that is what we want, we must dare to imagine such a world, and then begin making choices about it (158). We should not be surprised by what visionaries have prophesied. While childhood should remain a protected category (unlike the Middle Ages), the protection should not be paternalistic, but empowering. I tell my students that the shift from parents to peers as a reference group is a quite natural progression. We want them to have peers as a reference group, as they will be running the world someday, “when I’m in my dotage,” as I tell them. Given the way other adults are running this world, their future, into the ground it behooves us to partner with them. To fail to do so is to lack a quite adult concept of generativity. This is how we go on, through youth. Even though I consider myself “post–Catholic,” I do still celebrate Christmas, and love the anticipation of it, in other words, Advent. One of the ways I stay mindful during a season that can pull one off her or his center is to observe the “O Antiphons.” I’ve decided to do this in Instagram this year. Enjoy! For some reason this quotation strikes a nerve with people. This is my most reblogged post ever on Tumblr, and the reblogging comes in waves. I posted it months ago, and every once and a while it goes through a wave of reblogging. It’s currently in one of those waves. Here we go again (and we love it)! It’s that time of year again. Actually, it begins today! This is the spring cleanse I recommend for those of us living in the Northeast US. Charlotte Clews is geeky, fun, and accessible. You won’t be sorry who join us. 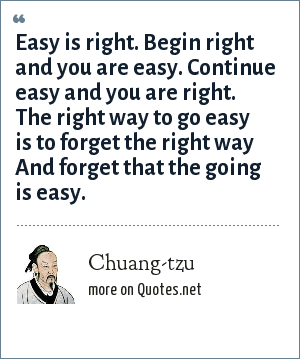 I thought that I had this quotation by Chuang-Tzu up on the blog somewhere. I guess I have others here, here, and here. What prompted this inquiry was the chorus of this song by Sarah Jarosz as my ear worm. Today as snow falls outside my window, and I’m inside hunkered down doing the “administrivia” that needs attention, things are going more smoothly than I had anticipated. When one begins with the right mindset, or in this case “heartset,” to coin a phrase, such things are possible. I think it’s ultimately all a question of what aligns, and what aligns, now in this moment. Yesterday, I was sitting around in a café aprés yoga with some friends, discussing our midlife spiritual crises, among other things. Not the garden variety of midlife crisis, but the deeper one which impels the others. It is the one in which one realizes that one is not living one’s own life, but one provided by all of those others, from one’s parents to Madison Avenue (a quaint term for advertising for all of you millennials. I’m not going to sugarcoat this because this is somehow a blog about yoga and sociology. I’m not going to pursue some path of dispassion because I think either mindfulness or social science demand it. I think that the election of Donald Trump to the highest office in the land is an unmitigated disaster. It’s a bleak and dark period that severely threatens the experiment that is this republic on these shores. No amount of civility of mere “niceness” will blunt the impact of this. I’d been loathe to face students about this disaster. Previous generations, mine included, but moreso the ones ahead of mine, have saddled them with problems enough: an “armed madhouse” of foreign policy, anthropogenic climate disruption, Gilded Age levels of inequality, and deep racism. Upon this powder keg we have placed a leader with a short fuse, and as technology marches forward, a leadership which seeks to turn the clocks backward. Welcome to the Hunger Games. May the odds be ever in your favor. My choices, which have led me to teach in a public university as adjunct faculty, hobble my efforts to offer a political education. It’s unethical, by sins of omission or commission, to adopt a stance of advocacy in the classroom. How does this professionally precarious professor offer hope and constructive alternatives while avoiding charges of partisanship? Playing safe and nice is precisely that, safe. One student is a dual national by virtue of his mother’s marriage to an American. “We just had a coup there,” he quipped of his country of origin, “so I’d rather this result than that.” It’s all relative, I suppose. Another student said he was grateful for the success of initiative petitions in this state. Indeed, I heard on DemocracyNow! that states had voted on over 160 initiative petitions, and that historically, such things are more common with greater inequality. We are at the highest levels of social inequality since the Gilded Age. What is salient to me in the reaction of aware students to the outbreak of hate in the wake of Trump’s ascendance is their humility. Many who spoke out at a campus protest Wednesday disclaimed their knowledge and ability to covey it. “I’m not a public speaker…” many began. “I’m just a [fill in the blank with the name of a marginal community]…” They know what they don’t know, yet they are beautifully articulate in their authenticity. I feel we have bequeathed to this generation who did not vote for him the worst mess of any of our lives. They do not disappoint in rising to this, and I consider it a privilege to journey with them. Please refuse the narrative of navel–gazing privileged young people. Please support their self–direction as surely as Ella Baker supported SNCC, and my professors supported me. They do not accept easy answers, nor should they. Please listen to them. The important question now is what hope to offer all whom this outcome “others,” in a nation which has chosen easy lies over hard truths. I don’t think it’s Democrats who need to do soul–searching as much as all of America. It’s not mere “division” that characterizes this outcome, but deliberate, dangerous polarization. It’s deliberate, dangerous polarization at a time we and the world can ill afford it. Perhaps it’s the same sort of hope, against hope, engaged by our sisters and brothers of the Standing Rock Sioux tribe, holding by their fingernails to shreds of dignity in a world gone selfish, profligate, and mad. I’ve waited a decade of teaching for students to become this aware. I’ve waited over thirty years since I was a student myself to see this level of activism among students. I’d rather such leadership appeared under different circumstances, but we do not choose our times. What is important is how we spend our time in what we’re given. Do we, like my students, cultivate an awareness of the wider world, including the wide world within our borders? Do we look for opportunities for the successes available to us? Do we accurately perceive the forces arrayed against us and respond appropriately? When politics and economics fail, civil society may avail. We who have tools to share, experiences to offer, perspectives to articulate, must do so. But we must check our privilege, and age is but another vector of privilege. Elise Boulding was prescient to suggest this in her millennially optimistic Cultures of Peace (2000) Young adults will one day run this world, inheriting a past very different from our own. Our experiences may inform, but never fully prepare for a world we could scarcely anticipate. Let’s commit to listen to them and their concerns, thus clinging to shreds of hope to redeem ourselves somewhat from this mess we’ve created for them. From the archives: reflecting on an all day rain. It has been a quiet week in Lake Wobegon. We got a good rain on Wednesday, a long soaking rain, good for field and garden and lawn. It was so dry, no rain for a month. The ballpark grass looked dead last Sunday, the lake level fell and rocks showed in the river. It began to rain in the night Tuesday. People woke up and lay listening to it. — Garrison Keillor, “Rain Means Life Continues in a Town that Time Forgot.” via Times Union – Albany NY. Date: Saturday, November 7, 1987 Section: MAIN, Page: 1A Excerpted from Leaving Home, published by Viking Penguin Inc. The Considered Kula by Richard Hudak is licensed under a Creative Commons Attribution-NonCommercial-ShareAlike 3.0 Unported License.